Having run for almost 30 years (and counting! ), The Simpsons is the longest running sitcom in the world. As with all good series, however, a number of fans will argue that things can get stale around the middle of their duration, and The Simpsons is absolutely no exception to this rule. Some say, that around seasons 10-11, the show lost its way, and became a parody of itself. Yet this is only an opinion held by some fans, and we’d like to give a shoutout to Simpsons fanblog, FY Springfield, for upholding the idea that The Simpsons didn’t lose its way over seasons 10-11, it merely changed comic direction. 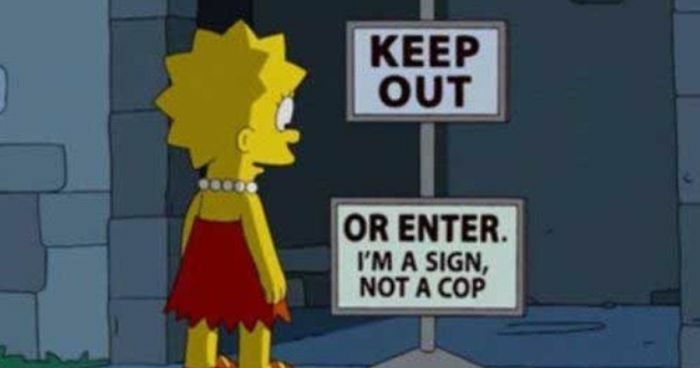 In the list below, the good people from FY Springfield have compiled a list of the best Simpsons jokes from later series, proving that one of the world’s best-loved sitcoms remains as funny as ever! Most people will still obeye. Like with a red traffic light on an empty street at 3am. This is not a joke, but one of the rare moments when Homer behave as a husband Marge deserves. Bart, you are wise beyond your years! Little trivia, all simpsons characters have four fingers. Yet god is always depicted with five fingers. Well, Jobs used to be explicit in his opinions about his customers → "Stay hungry, stay foolish". Self-explanatory. Skinner being a good teacher, wow! What episode is this? He is playong a banjo! Just opened in the Electra (shopping) Complex. Lisa understands the important things in life! You don't throw away your lunch box when you're done eating, you bring it back home with you. Yep, that's absolutely true. Sorry guys - be helpful if you were clairvoyants! If Marge is funny and no one's around, was Marge really funny? No one's going to touch this one?